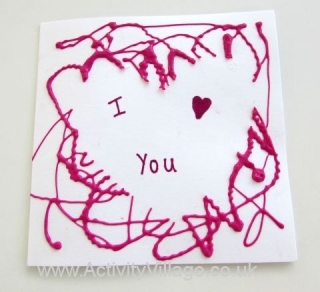 Valentine’s Day is a great excuse for a crafty session with the kids – after all there is nothing better than getting a little something made by someone you love! 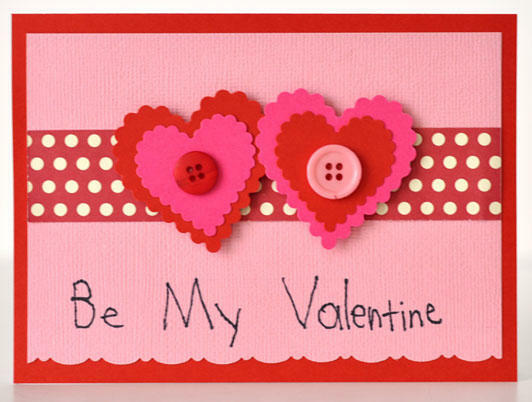 In some parts of the world it is traditional that a child takes a little Valentine card or gift in for every other child in the class, and if this is the case in your neck of the woods we’ve got lots of suitable ideas below. This beaded ornament is fun for kids to make for Valentine’s Day or Christmas – it looks very pretty hung on a tree or in the window – or you could even make a miniature version as a pendant! 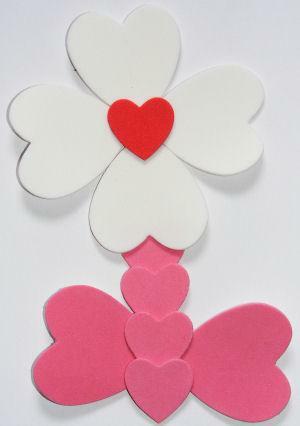 This butterfly magnet makes a cute craft for kids for Valentine’s Day – perfect for cheering up the front of the fridge! Children can try making this pretty coffee filter rose for Valentine’s Day or Mother’s Day – it’s so pretty, who wouldn’t be happy to receive it! Kids can make this cup and ball lovebug craft for Valentine’s Day or any time they want to make something for someone they love! 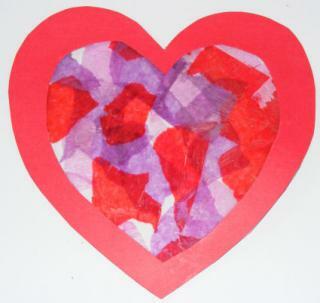 Here is a cute idea for a Valentine’s Day craft to do with your kids. 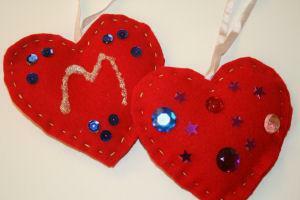 Make these beautiful felt heart decorations with your children and have a beautiful Christmas tree decoration to hang every year! 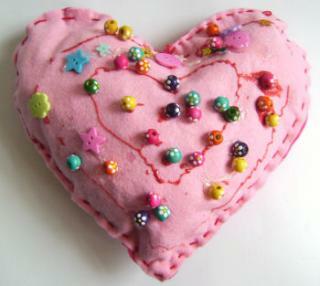 Children can practise their sewing skills to make this pretty felt heart pillow – then decorate it with odds and ends to make it really special. The needle case in the photo has been created for Valentine’s Day, but you could obviously adapt this craft for other times of the year. 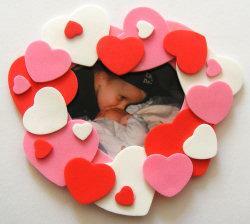 This quick and easy foam heart photo frame uses pre-cut bought foam hearts. 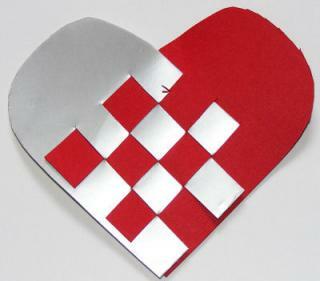 This craft can of course be adapted for all sorts of holidays and events, but we’ve done it here for Valentine’s Day. 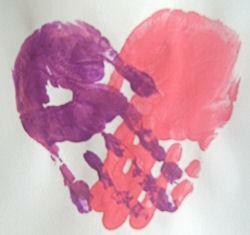 If your child prints a handprint heart, it will be yours forever! 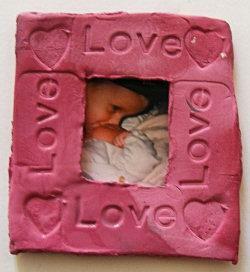 These make a super quick craft activity for Valentine’s Day or Mother’s Day and a lovely keepsake, too. We used papier mache heart-shaped boxes from the craft store and decorated them for Valentine’s Day – an easy valentines craft for kids! 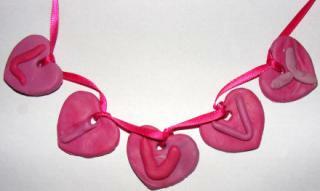 Give a special friend this personalized heart choker necklace as a very special present! 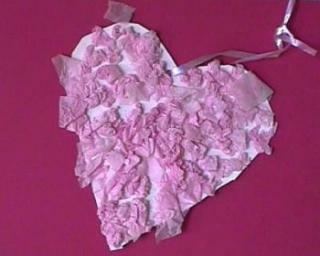 This heart flower makes a quick and easy Valentine’s Day craft activity for kids. 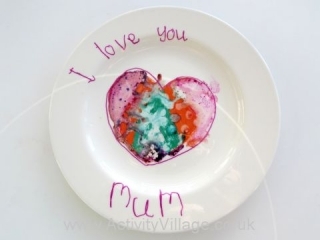 Here’s a handmade kids craft which anyone would be proud to display on their fridge – perfect for Valentine’s Day or Mother’s Day. 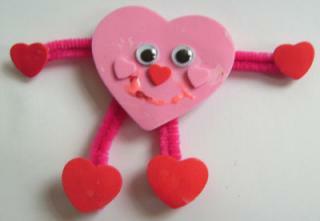 This little heart man is a super quick craft for kids at Valentine’s Day – fun as a magnet for the fridge, a badge, the front of a card, a key ring – or just to give as he is. 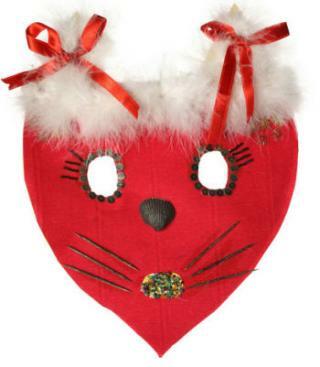 This Heart mask is perfect for kids to make and wear on Valentine’s Day. 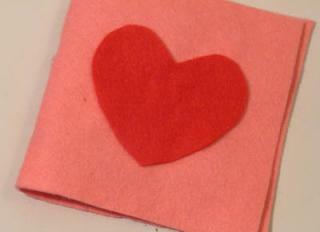 Start by cutting a pointed heart shape out of card. 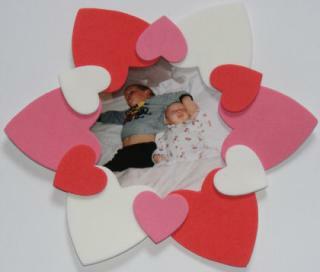 This heart photo frame is a pretty way to display a favourite photo for your Valentine! 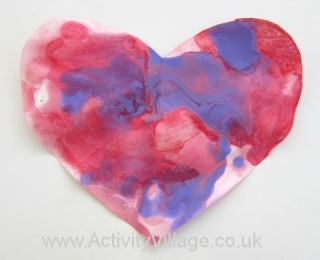 Here’s a sweet craft for Valentine’s Day or Mother’s Day which the kids will enjoy – and it looks very pretty! 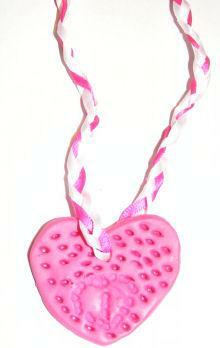 This pretty necklace, with a heart plaque made from polymer clay, would be a fun craft activity for Valentines Day, Mother’s Day – or anytime! This simple idea is great fun for the kids, and of course can be adapated using all sorts of templates. How about a Christmas tree, a flower, a simple butterfly or a summer sun? 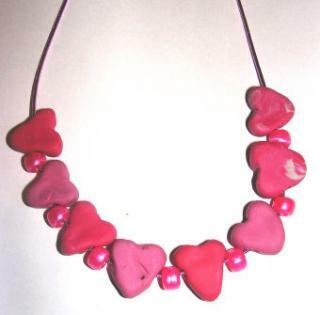 Here’s a pretty Homemade Heart Bead Necklace using polymer clay that kids will enjoy making for Valentine’s Day, Mother’s Day – or themselves! 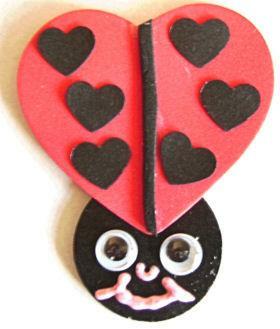 This cute ladybug magnet is perfect as a little gift on Valentine’s Day, but can be used for Mother’s Day or other occasions. Quick and simple to make, these little Love Bracelets make great Valentine’s Day gifts for friends, family and sweethearts! Make this “love wreath” for Valentine’s Day so that your child can spend some time thinking about all the people (and things) that they love. 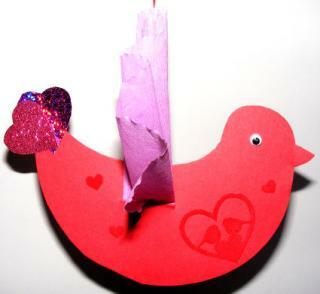 This pretty lovebird craft is great for Valentine’s Day. Try it as a class or group project and fill your classroom with gorgeous lovebirds! 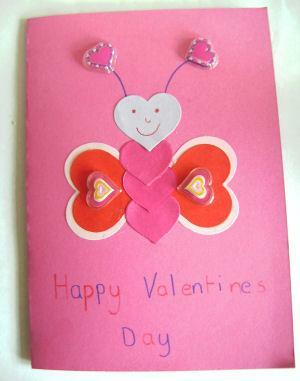 Make this cute “lovebug card” out of many different sized heart shapes – fun for kids of all ages. 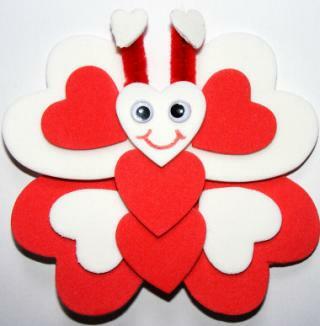 Children will enjoy making this cute little lovebug for Valentine’s Day – it’s perfect to give to friends and family! 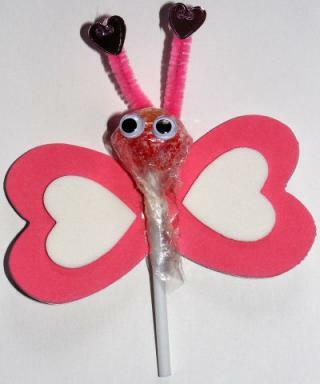 This lovebug lollipop is a perfect little Valentine gift for children to give to classmates or friends on Valentine’s Day. 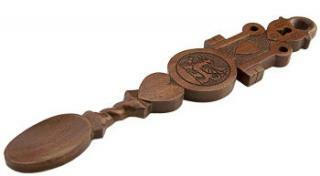 The giving of lovespoons dates back to the 17th Century. Traditionally, they we given by young men to young ladies in the hope that they would lead to courtship or engagement. 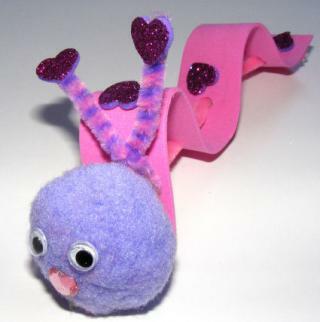 Make this loveworm bookmark craft for kids for Valentine’s Day – he’s cute, quick and fun and makes a sweet gift! The finished card is so pretty, I wish our photos did it justice! 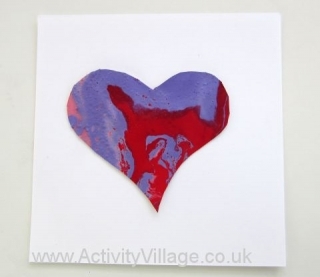 Sam enjoyed watching the paint colours run together when we were doing this Valentines craft. It was a bonus when we discovered the heart looked pretty in the window as a suncatcher! We’ve tried an unusual technique for this plate which made the design rather exciting! Of course you could adapt this for all sorts of events and use different shapes and pictures. 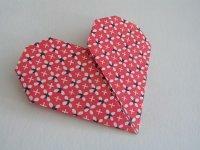 An origami heart is fun to make all year round, but of course it is perfect for Valentine’s Day too! 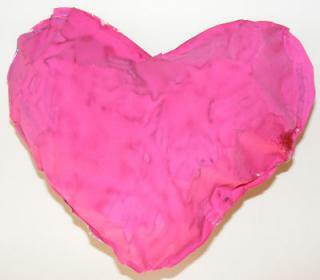 Little kids will have fun making and painting this paper heart pillow. All you need is some newspaper and lots of paint! These pipe cleaner hearts are a simple little craft for kids for Valentine’s Day, but they are fun to make and very effective. A good craft for all ages. Puffy paint is always a fun activity, especially when you mix it up yourself! And a heart is a simple shape for all children to manage. 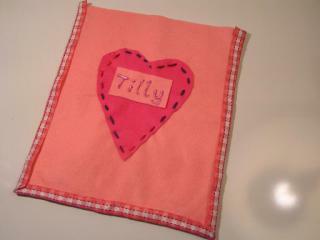 This makes a cute gift for kids to make for Valentine’s Day or Mother’s Day – or just for themselves! It looks pretty hanging on a pencil case or satchel. 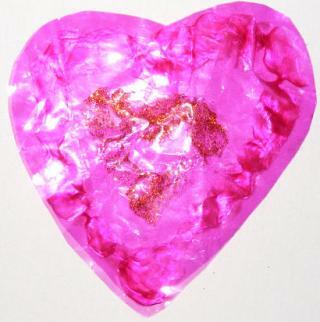 This suncatcher heart looks very pretty displayed in a sunny window! This is a good craft for little children. 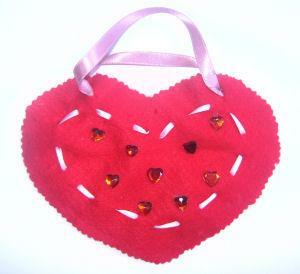 Here’s a pretty suncatcher heart to display in your window for Valentine’s Day. 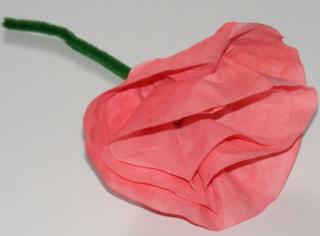 Children will enjoy tearing the tissue paper and creating their design. This is such a simple Valentine craft idea, but effective! Little children especially love scrunching up tissue paper, and even the youngest can get involved. 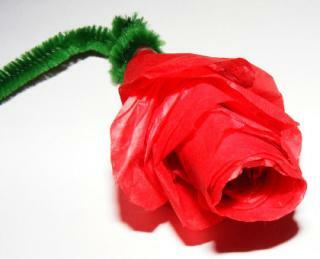 Children will enjoy making this tissue paper rose, which makes a sweet little home-made gift for Valentine’s Day or Mother’s Day or a pretty craft for a summer theme. 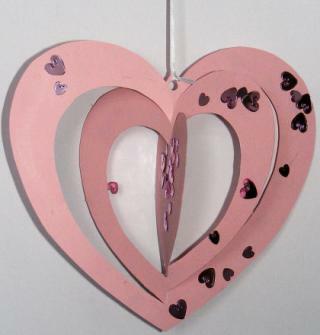 This twirly heart mobile is made from card with some simple cutting techniques. It looks very pretty and effective when hung in a breezy spot! 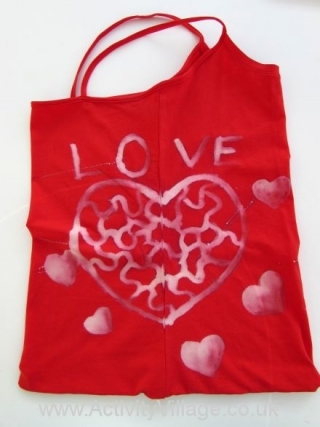 Here’s a really special recycling and sewing craft that results in a really special gift. We’ve themed ours for Valentine’s Day but of course you could adapt this in many ways. 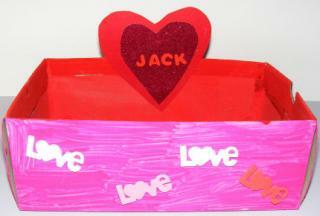 This Valentine Card Box is fun for kids to make – and it will be a very useful storage place for the many Valentine’s Day cards they will receive! 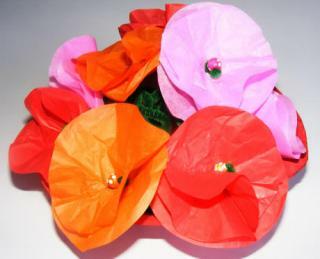 This is an easy craft for kids of all ages using supplies that you will have lying around your house. Of course you can adapt it to suit what you have at hand. 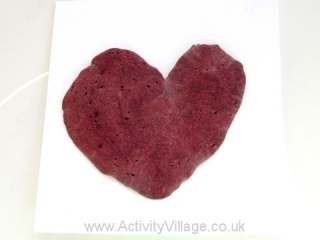 Here is a quick and simple Valentine craft which can be adapted to suit the materials you have to hand and the ages of the children. 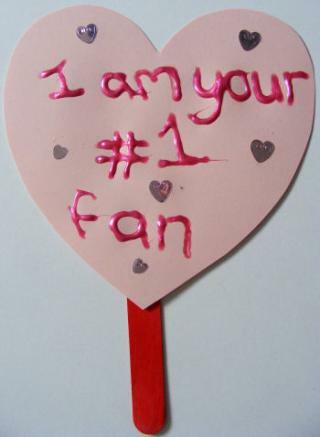 Our Valentine Fan is a fun idea for Valentine’s Day – and it’s quick and easy to make, too! The Valentine Holder in the photo has been created for Valentine’s Day, but you could obviously adapt this craft for other times of the year – perhaps for favourite birthday cards? 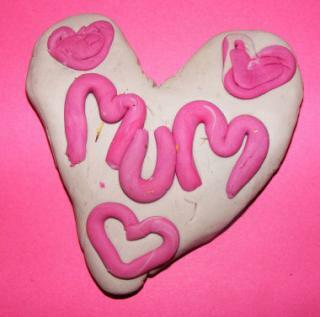 Kids can make these to give to friends and family on Valentine’s Day – a sweet valentine treat! This pretty mobile is made by recycling a kitchen roll or loo rolls. It looks so pretty hanging in the window! We had great fun making these salt dough plaques for “best friends” at school. 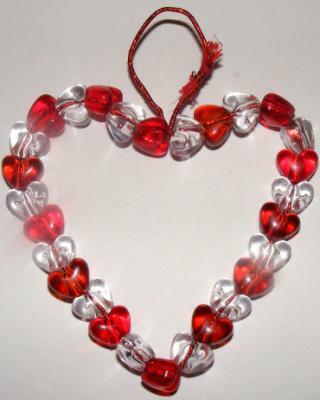 Children love to make these Valentine shaker bottles! 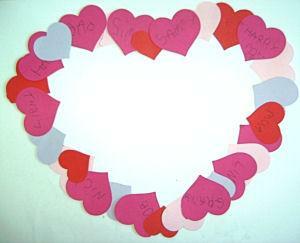 They make a fun, inexpensive and easy group activity for a Valentine’s Day party too! Dress up your Valentine’s Day with these fun Valentine drinking straws! 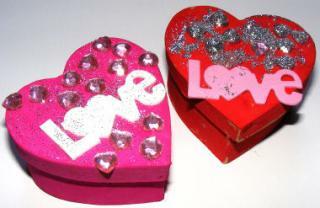 Quick to make but nice to receive, these Valentine’s Day pencil toppers are an easy little craft idea for kids. 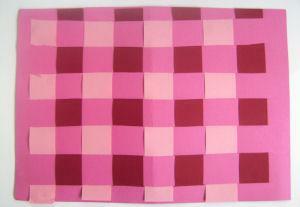 Your children can weave this Valentine’s Day placemat in pretty colours to decorate the table on Valentine’s Day. This pretty woven heart craft is a little tricky to master but very effective – and once you’ve made one, you’ll want to try more!